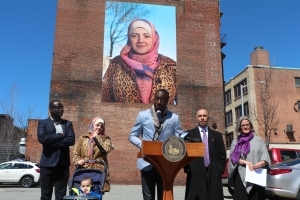 In April 2017, Meehan refreshed the project by adding a new portrait that replaced “Rosaleen.” Bidur is a Syrian refugee who moved to Rhode Island after fleeing her homeland. In the wake of race-based civic upheaval in such cities as Ferguson and Baltimore, it is vital for the conversations like the ones taking place in Providence to continue. How can we examine the filters that prevent us from seeing one another clearly? What is the impact of using art to make intimate and deep connections with our neighbors, and of using our daily human cityscape, rather than a traditional gallery setting, to present this work? 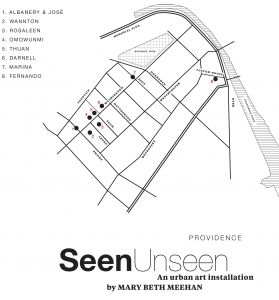 Viewers are invited to interact with the work in the urban landscape, to investigate the presumptions and reactions it raises, and to read more about the people photographed and the process of making the work at Meehan’s Seen/Unseen blog. 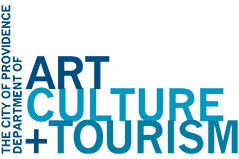 In addition to being funded by an NEA “Our Town” grant, Meehan’s work has received generous financial support from the Rhode Island State Council on the Arts, The Rhode Island Council for the Humanities, and PopUp Providence, and was installed by FirstWorks and the City of Providence Department of Art, Culture + Tourism. 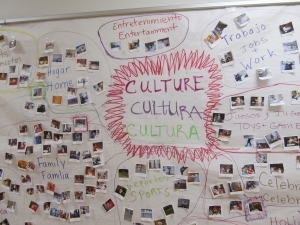 Meehan not only created the downtwon exhibition, she also worked with third grade students at the International Charter School of Rhode Island, a dual-language elementary public school in Pawtucket, to create a photography exhibition of their own cultures and narratives. 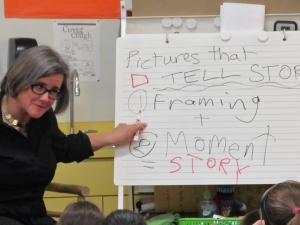 Thanks to Eileen Landy for her photographs and documentation from ICS. About the artist: Mary Beth Meehan is a New England-based photographer and educator committed to meaningful, in-depth coverage of her own communities. Her first public installation of photographs took place in 2011 in her hometown of Brockton, Massachusetts, with a series entitled “City of Champions.” Her work has appeared in The New York Times, The Washington Post, The Boston Globe, she has exhibited her photographs nationally and internationally, and has lectured nationwide on the subject of long-term, community-based documentary projects. A former staff photographer for the Providence Journal, her honors include awards from Pictures of the Year International and the National Conference for Community and Justice. She was nominated twice for the Pulitzer Prize. Born in Brockton, Massachusetts, Meehan earned a degree in English from Amherst College and a Master of Arts in photojournalism from the University of Missouri. She lives in Providence.